Over the past fifty years the development of advanced materials has rapidly progressed, solving many long-standing problems in a variety of fields ranging from pharmaceutics to electronics. While the chemical compositions and designs of such materials vary greatly, their success is ultimately driven by a combination of molecular structure, intermolecular interactions, and corresponding vibrational dynamics. My research interests lie at this interface, and we use an array of experimental and theoretical techniques to fully understand the fundamental forces that drive the performance of advanced materials, including pharmaceutical solids, organic semiconductors, metal-organic frameworks, and biological macromolecules. Figure 1. Schematic of the hydrogen bond potential energy surface in crystalline purine, the building block for many DNA and RNA bases. The terahertz spectra are shown (bottom right) exhibiting large changes in temperature, shown at 300 K (red) and 100 K (blue). The core of my research is related to the structure-dynamics relationship of molecular solids, i.e. how molecules are arranged and the nature of the molecular motions present. Specifically, we use low-frequency vibrational spectroscopy, which is an extension of infrared vibrational spectroscopy to lower-energies that falls within the terahertz frequency window (0.3-30 THz, 10-1000 cm-1). The technique is similar in concept to FTIR, however unlike FTIR (which probes motions on individual bonds) the lower frequencies can excite large-amplitude intermolecular motions of entire molecules. Figure 2. 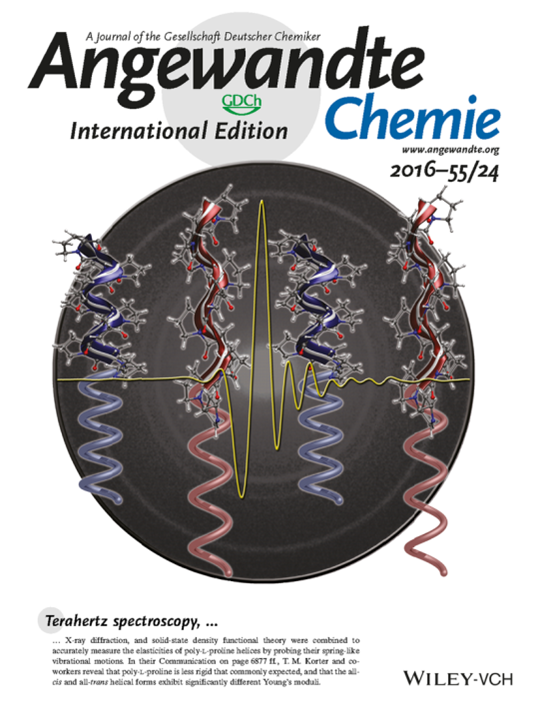 Cover art from a study using terahertz time-domain spectroscopic measurements to probe the mechanical response of a polypeptide. There is mounting evidence these low frequency dynamics play a decisive role in the proper functioning of materials, having previously been shown to be critical in biomolecular processes, solid-state phase transformations, and gas-adsorption in metal-organic frameworks (MOFs). My research focuses on understanding this important link by directly measuring the vibrational dynamics over an ultra-wide frequency range (0.3 – 30 THz), over ten-times the bandwidth that most terahertz time-domain spectroscopy (THz-TDS) systems currently achieve. Combined with quantum-mechanical simulations, we can gain unprecedented insight into the relationship between structure, molecular motion, and the bulk properties of materials. Figure 3. 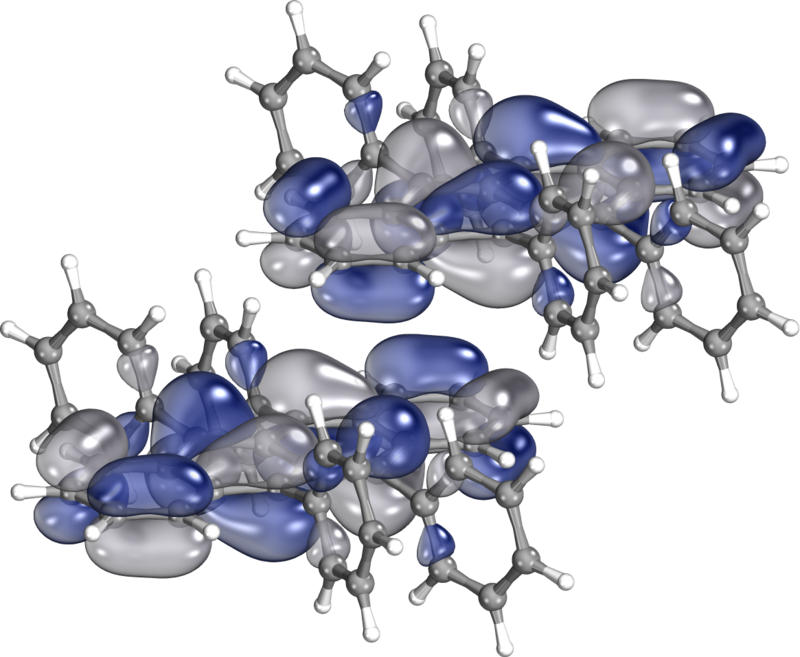 Highest occupied molecular orbital (HOMO) in the organic semiconducting solid rubrene. 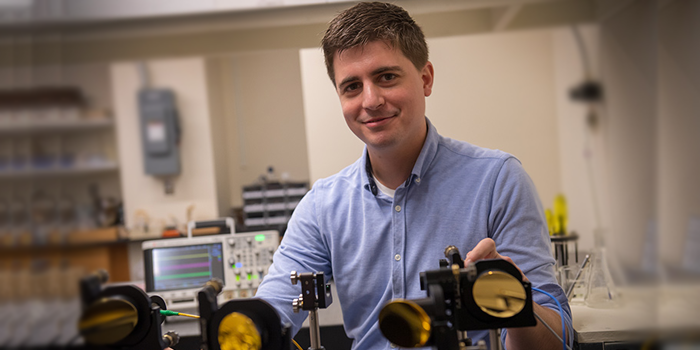 Using terahertz time-domain spectroscopy we can probe how the molecular orbitals change over the course of a specified vibrational mode, gaining insight into how charge transfer occurs within these materials. M. T. Ruggiero*, J. A. Zeitler, and A. Erba. Intermolecular Anharmonicity in Molecular Crystals: Interplay Between Low-Frequency Dynamics and Quantum Quasi- Harmonic Simulations of Solid Purine. Chem. Commun., 2017, 53, 3781–3784. M. T. Ruggiero, and J. A. Zeitler. Resolving the Origins of Crystalline Anharmonicity Using Terahertz Time-Domain Spectroscopy and ab initio Simulations. J. Phys. Chen. B., 2016, 120, 11733–11739. M. T. Ruggiero, J. Sibik, R. Orlando, J. A. Zeitler, and T. M. Korter. 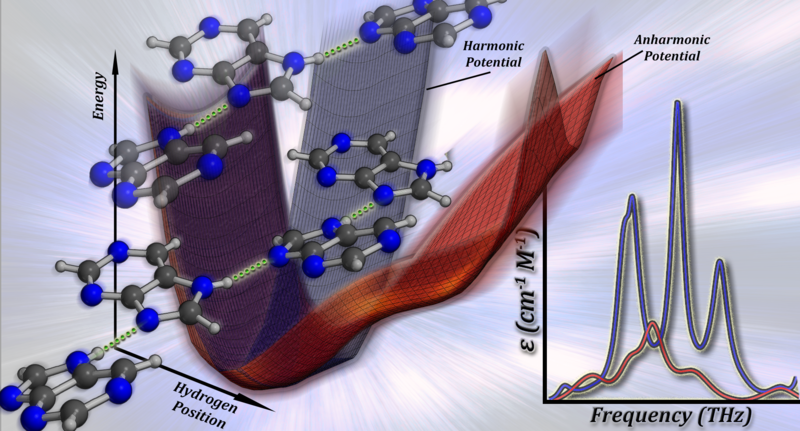 Measuring the Elasticities of Poly-L-Proline Helices with Terahertz Spectroscopy. Angew. Chemie. Int. Ed., 2016, 128, 6991–6995 (2016). (Featured on Journal Inside Cover, featured in C&E News, Terahertz Radiation Probes Polymers, 2016, 94, 30–31. M. T. Ruggiero, M. Krynski, E. O. Kissi, J. Sibik, D. Markl, N. Y. Tan, D. Arslanov, W. v. d. Zande, B. Redlich, T. M. Korter, H. Grohganz, K. Lobmann, T. Rades, S. R. Elliott, and J. A. Zeitler. The Significance of the Amorphous Potential Energy Landscape for Dictating Glassy Dynamics and Driving Solid-State Crystallisation, Phys. Chem. Chem. Phys., 2017, 19, 30039–30047. M. T. Ruggiero, J. Sibik, A. Erba, J. A. Zeitler, and T.M. Korter. Quantification of Cation-Anion Interactions in Crystalline Monopotassium and Monosodium Glutamate Salts. Phys. Chem. Chem. Phys., 2017, 19, 28647–28652. M. T. Ruggiero, J. A. Zeitler, and T.M. Korter. Concomitant Polymorphism and the Martensitic-Like Transformation of an Organic Crystal, Phys. Chem. Chem. Phys., 2017, 19, 28502–28506. A. S. Larsen, M. T. Ruggiero, K. E. Johannson, J. A. Zeitler, and J. Rantanen. Tracking Dehydration Mechanisms in Crystalline Hydrates with Molecular Dynamics Simulations. Cryst. Growth & Des., 2017, 17, 5017–5022. M. T. Ruggiero, J. Sibik, J. A. Zeitler, and T.M. Korter. Examination of L-Glutamic Acid Polymorphs by Solid-State Density Functional Theory and Terahertz Spectroscopy. J. Phys. Chem. A. 2016, 120, 7490–7495. M. T. Ruggiero, J. Gooch, J. Zubieta, and T. M. Korter. Evaluation of Range- Corrected Density Functionals for the Simulation of Pyridinium-Containing Molecular Crystals. J. Phys. Chem. A. 2016, 120, 939–947. Characterization and manipulation of material properties using low-frequency vibrational waves. Techniques including terahertz-time domain spectroscopy and quantum mechanical simulations are applied to pharmaceutical solids, organic semiconductors, metal-organic frameworks.